It’s the end of November, and my favorite holiday is almost upon us. Thanksgiving. For most people, Christmas is where it’s at, and don’t get me wrong, I love the Christmas tree, the happiness of spending time with family, and the gifts. For me, however, Christmas falls short to Thanksgiving, a holiday where all you are really required to do is show up and eat. I take a lot of my cooking skills from my mother, and she’s been cooking a lot longer than me, so I’m excited to eat, drink, and be merry with my family. That being said, I will be leaving for home tomorrow and taking a little break from writing the blog, at least until Thanksgiving is done. In the meantime, I want to share a little dish I made the other night for my roommates and myself that had all the flavors of Thanksgiving and was super simple to make, for those who cannot wait until Thursday. 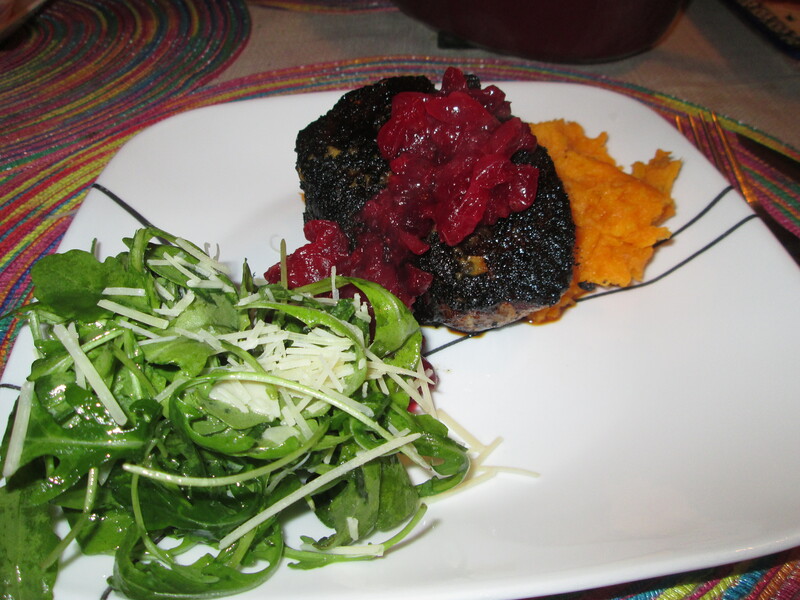 Spice rubbed (and a little blackened) pork, mashed sweet potatoes, warm cranberry relish, and an arugula salad. Happy Holidays. 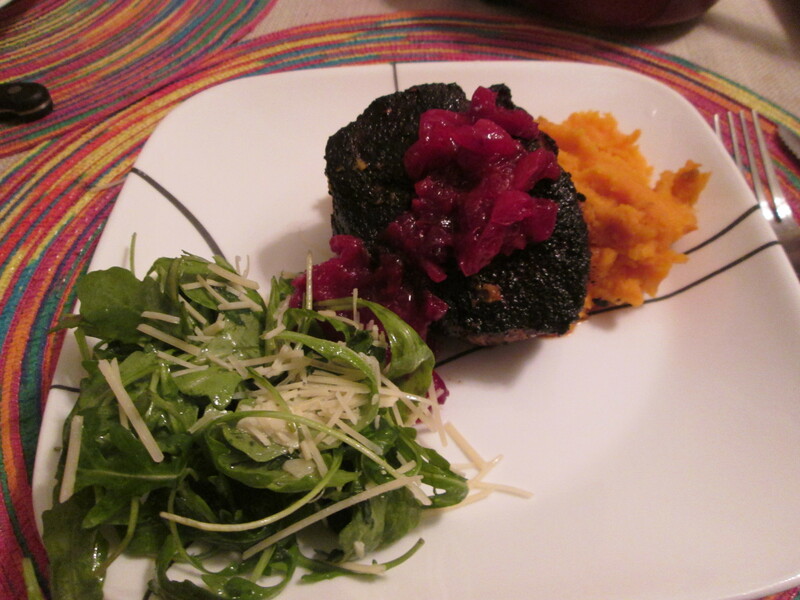 All the items are simple to make and come together wonderfully on the plate. I made this recipe with many things I just had lying around the house, but this rub is awesome. You can edit the rub based on what you have on hand, or buy any spices you’re missing. Rub this liberally on the pork and place in and oiled pan until cooked through, about 6 minutes per side. For the mashed sweet potatoes, take the yams and peel and dice and put in a pot of salted boiling water until tender, about 20 minutes. Drain and mash with butter and a little chicken stock, if you have it. For the cranberry relish, take the cranberries, about a cup of sugar, a teeny bit of water, and some zest of the lemon in a pot over medium heat for about 15 minutes, or until all the cranberries have burst. For the salad, mix arugula with olive oil and the juice of the lemon, salt and pepper to taste, and some shredded Parmesan cheese, if you have it. 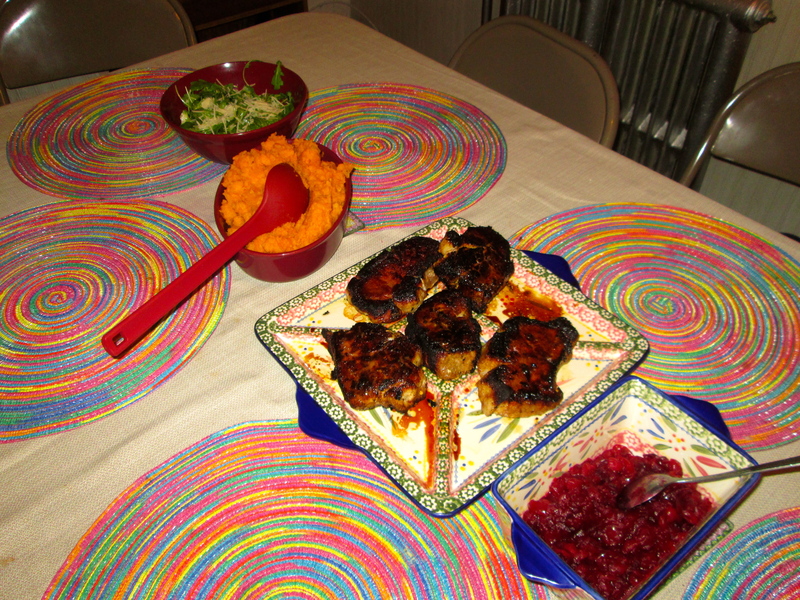 Put all dishes together on a plate and enjoy the flavors of my favorite holiday.